Last night I attended in a meeting with the people that will plan courses for the Nordic Junior Meeting. We agreed on how the area should be used to best effect. The same competition venue will be used for three races so we had to plan the courses so that runners run as little as possible in the same place. One person is working hard to draw the map. Just over half of the map is complete. I have not been on it yet but it looks good. Here you can see some of the old map. This particular area is just outside the contest area and is fairly typical of how it looks. There are also some areas that have a completely different character. Now it is clear how the Nordic Junior Meeting, the competition that replacing the Nordic Championships in 2011, will look like. Thursday, May 5, it is a sprint race, whith the Sprint championchip for Stockholm. Friday, May 6th is the middle distance race and probably also a public event on the same courses. Saturday, May 7, it is a long distance race with Silva Junior Cup and an audience contest. On Sunday 8 May, it is a mixed relay where even district and club teams are welcome to participate. The team must include four runners from the class M 20, W 20, W 18 and M 18. Winningtime on each leg will be 40 minutes. There will also be a public contest over middle distance. A few day ago I was out in the woods to become more familiar with the terrain. Here are some pictures. Now the course setting work begin in earnest. I will be responsible for the relay. There has been a while since I wrote something about the coursesetting work. It's mostly because the work has been down for quite a few months. 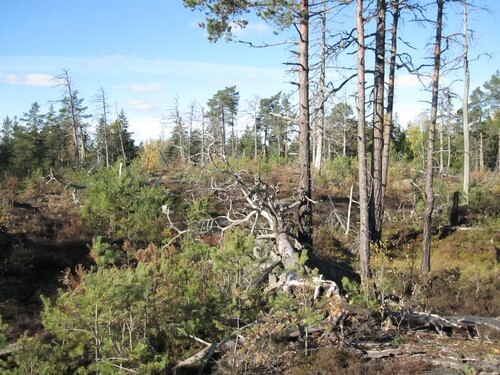 Now, the Nordic orienteering federations jointly decided to terminate the Nordic Championship with immediate effect. Instead they want to try creating a new race, the Nordic junior meeting or whatever it´s name would be. The idea is to create a good competition for juniors in the Nordic countries and maybe also from other countries. Therefore, it becomes a bit shorter competition program at the same time that the NOC would have been implemented. The weekend begins with a sprint race on Friday. Then it becomes a middle- or longdistance race on Saturday and closing a relay race with mixed teams. Two girls and two boys to be included in the squad. All the details are not clear yet and it feels like it's getting a bit short of time. 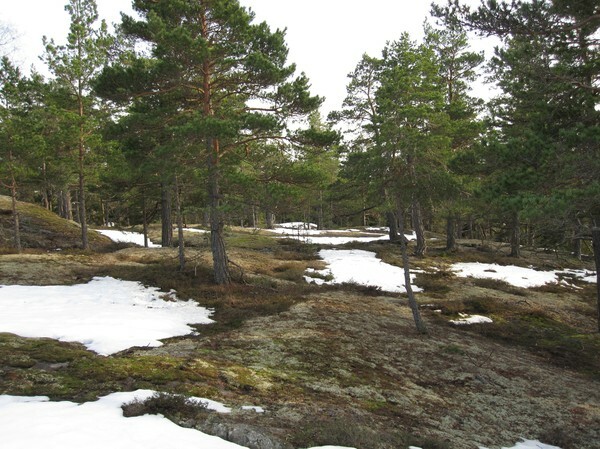 If it gets as much snow this winter as last winter, only two and a half months are left bare. Then snow until late April and then it is only days away. Right now there are almost no courses exists. Today I ran in the area. It is very nice terrain. There is good visibility and easy to get around. In a few places hindered accessibility of some denser forest. There are also wide variations in terrain. Just 250 meters from where the last picture is taken the terrain is very different. I think it can be very good races. Now it's just to get to work. ... if one can be in love in a forest. 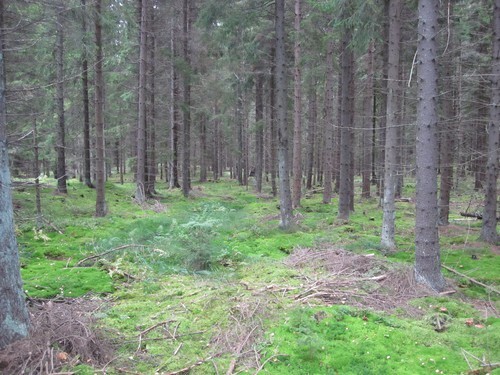 Last week I was out in the forest and ran. I ran in some of the area that may be used at the NOC 2011. I know it's nice terrain, but I had no special expectations. When I was out in the forest I fell in love. 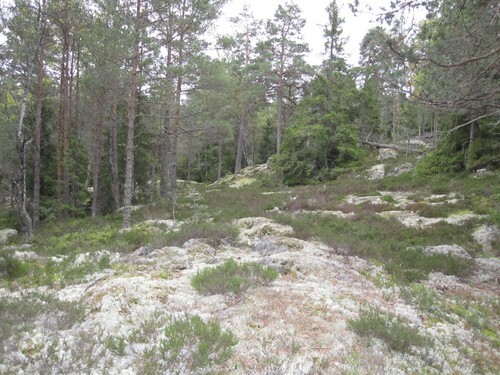 There were different types of terrain and the terrain was very nice. 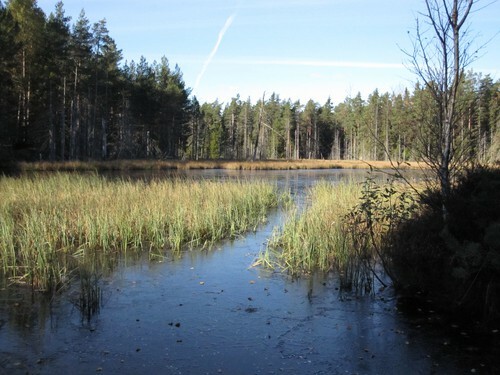 Although I do not live more than a few kilometers away and even though I run near this forest earlier I did not know that this was this nice. Unfortunately, I had no camera with me so I have no pictures. However, I can bid on two maps of terrain similar to what I ran in. 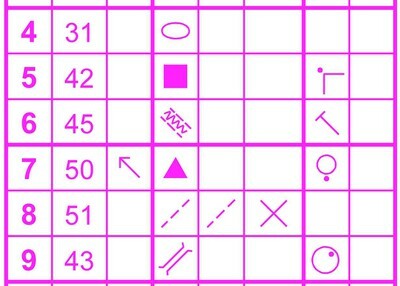 The first map is from Nyköping OK's competition in April 2009. Just here it was very nice terrain where I could run fast. There were no barriers on the ground. There were some hills that have a lot of details. 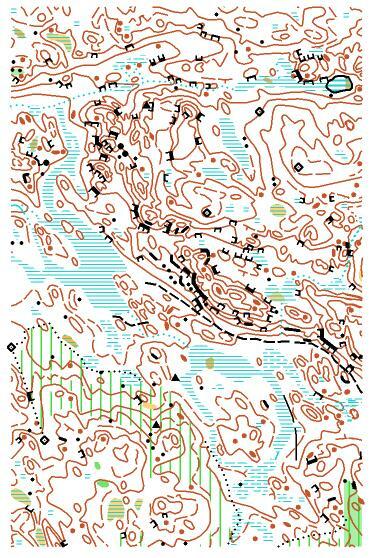 This map is from the middle distance championships in Stockholm 2009. This is quite similar to where I ran last week. In some places there were terrain similar to the controls at 6, 7 and 8. But there were also similar to the terrain at the other controls on the map. In addition, there was an area that is unlike anything else I run in earlier. Next time I might take the camera whit me so that I can take some pictures. Right now I have two current course planning projects. Now in the nearest it is the region championship in sprint for Stockholm an in a year it is the Nordic Championship. Saturday I ran from home to the sprint area. I managed to run through almost the entire area and I also took down six controls from the clubtraning last Thursday. All in all, it took less than an hour. Sunday I ran from home to the competition area for the Nordic Championship. All in all it took two hours and five minutes and I was able to just run a little while in the area that is closed until the races has been decided. Below you can see a small map. I ran trough this small area on the way home. This particular area is outside the area that is closed but it is still typical of much of the competition area. 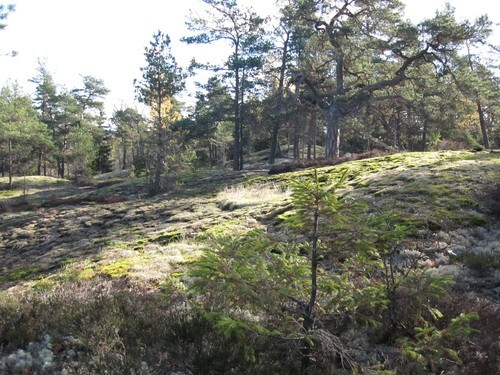 Last Sunday I was out in the terrain where the NOC 2011 will be implemented. First, I needed to practice a bit first, and it was a good opportunity to familiarize myself with the terrain. I have been in the ground earlier but it was a while ago. In addition, I have almost only been there when I competed. Now I could take it easy and see the terrain in a different way. There is still a lot of snow left. 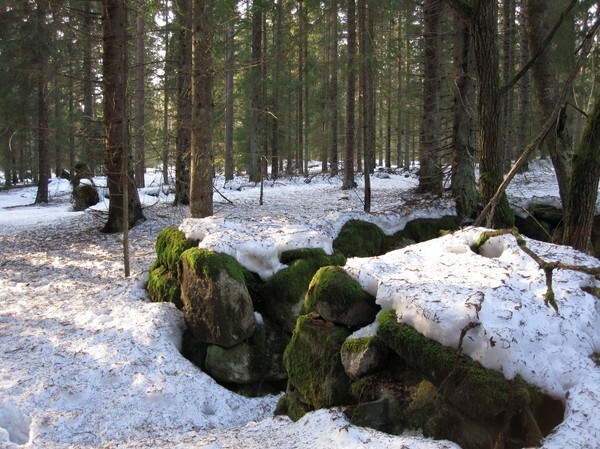 At this location is a bit dense woods and the sun will not proceed to melt the snow as effective as in the more open forest. Here is the 20-30 cm of snow left. Elsewhere, the Sun has been melting nearly all snow. It is now 13 months away from NOC 2011. Much work remains. Discussions are underway how to make the area the best use. There are two or three different races to be decided by the contest site. Therefore it is important to think through how the courses should reach the competition arena. Magne Lystad and Evy Garsell defended their victories when the third Nordic championships were decided in Denmark. The year was 1959 and the contest was held in Jutland in October. 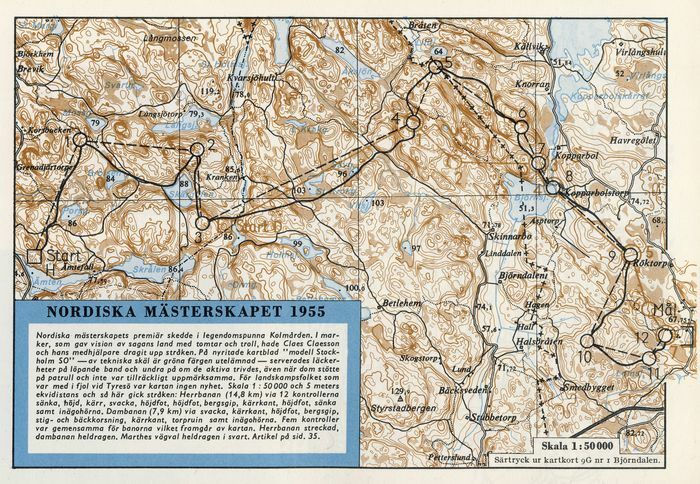 After the race the talk was that it was Magnes training camp in Vålådalen a month earlier, which yielded results. Gösta Olander on Vålådalen had never seen anyone train as hard as Magne Lystad did. At this time, the Nordic countries within the dominant orientation. It was seen as a nice presetation that the Swiss master Hansruedi Scheller came in thirteenth place. Team competition was won by Finland by Sweden. The other countries had no full team. Women's races were dominated by Sweden, which also won the team competition. It was only Sweden had the full team in the team competition. In the women was the only Nordic runners who participated. I would like to conclude with a few lines from the yearbook Skärmen. It describes the contestants lives outside the actual races. "After the awards ceremony were each handle themselves during Sunday night but even then cohesion was so great that most societies made in the beautiful Hanseatic city. It was then include visits to some very decent nightclubs, that is fairly dance restaurants, which, according to the barely years old law had to have open until the small hours. For most of the squad, this was tantamount to debut in such a place and even if the excitement was greater than the experience itself that helped the Swedish boys and girls in a peaceful manner, that the atmosphere was good and happy. " 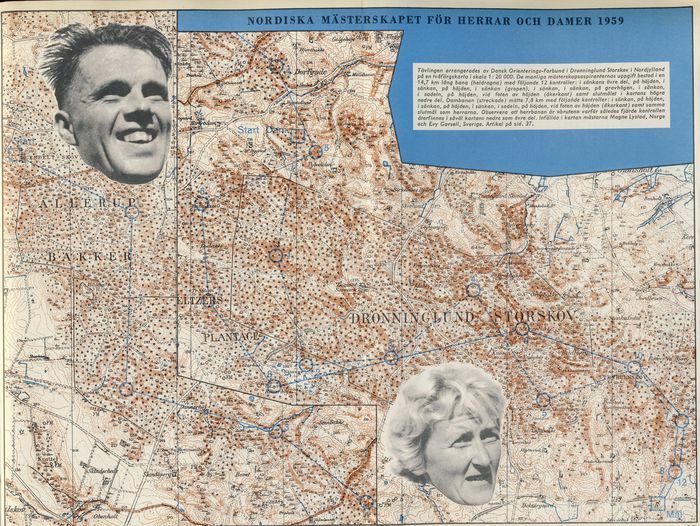 The year was 1957 and the second Nordic championships were decided three mil east of Trondheim, not far from the 2010 World Cup. Sweden and Finland dominated the first Nordic championchips two years earlier but now it was a lot of Norway. Among men were Magne Lystad superior to all other opposition and won the race by nearly six minutes before three Norwegians. The first Finn was beaten by 12 minutes and best of Swedish runners whith 15 minutes. Norwegians won the team competition of course, with 10 among the 21 first in the results list. Among women, it was Sweden who dominated the race. Three Swedes before the first Finnish. Evy Garsell was almost as superb winner as Magne Lystad. Team competition was won by Sweden, Norway. The race was also a participant from a country outside Scandinavia. On the 14th spot in the men's competition ranked Edgar Bächtold from Switzerland. He wass not participating in the competition because it would be many years before the Nordic Championships opened up to participants from countries outside Scandinavia. In the yearbook Skärmen is not so much written as from the first competitiont. It is perhaps because it was settled in Norway. The map is, however, and it might give an idea of what to expect at the World Championships in Trondheim later this year. Denmark was also in the race but not with enough participants to be in the team competition. The Danish participants were far behind the best runners. Danish runners will achieve better results at the Nordic championships later in time. Right now, I have several course setting missions underway. I have already written some of Stockholm's Sprint-DM in may this year. 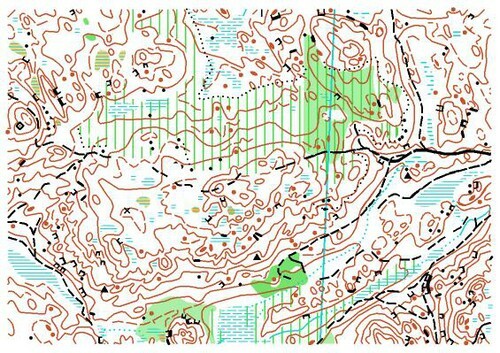 Next year, in May 2011, I will be one of the two Course setters for the relay at the Nordic Championships, NOC 2011. We will also add tracks to an audience of races which will be held in conjunction with the NOC 2011. I will be blogging about work on the runways, terrain, map, and a lot of other things around the NOC 2011. Despite my poor knowledge of English, I will also try to translate all the blogg posts of the NOC 2011 to english so that all participants have an equal chance to receiving the same information. I've looked a bit into the history books and found a lot of interest around the Nordic championships history. Before the premiere race had a Nordic international match arranged for a number of years. As of the 1955 championships was upgraded to a Nordic championships. 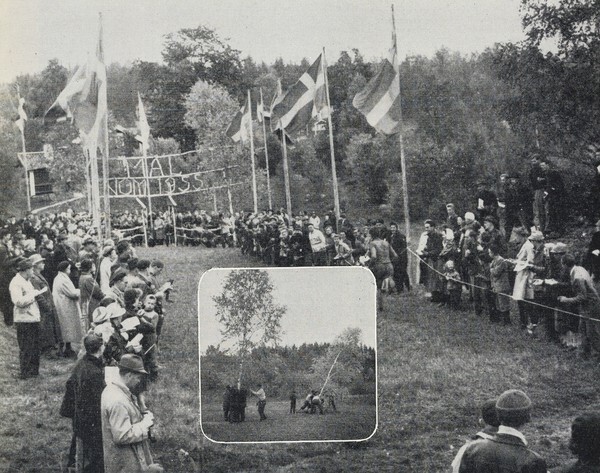 Premiere competition was conducted in Kolmården and in this way described the competition in the yearbook Skärmen from 1956. "Nordic Championship premiere took place in the legendary Kolmården. In the land that gave the vision of fairy tale land of gnomes and trolls." 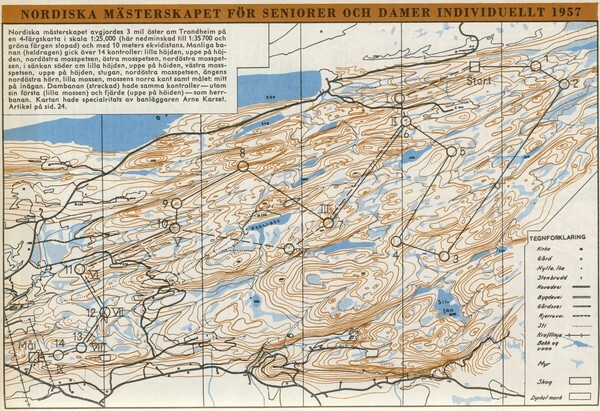 The map was considered a delicacy in the scale 1:50 000 and 5 meter contour interval. Mens course had a field length of 14.8 kilometers through 12 controls. Womens course was 7.9 kilometers long and contained 7 controls. Four nations participated, Sweden, Norway, Denmark and Finland. In the men's class, it became a Swedish victory by Marthe Andersson. Sweden and Finland dominated the men's competition, and among the top 20 was just one Norwegian runner. Although the women were dominated by Sweden and Finland. Top of the podium was Finnish Ella Hanelius followed by two Swedes. In these first Nordic championships were no relay. On the other hand it was anticipated up times for the top ten men and top six ladies. Finland won the teamcompetition for men followd by Sweden, while it was the opposite result for the women. Norway was third in both races. Denmark had too few participants to be in the team competition. Of course there are a lot of curiosities about the competition. 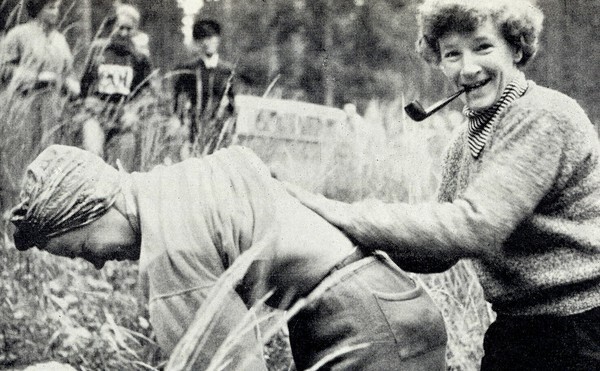 In the picture above this gives the pipe-smoking Norwegian teamleader Eva Voss Bendixen one of the Norwegian runners "last rites" before starting. Already in 1955 the competition arena was important. The organizer thought it was a bit too open at the arena. They solved it by simply cutting down some birch trees, digging holes in the arena and "planting" the birches in the pits.